If ever there was a classic seaside town it is Worthing. 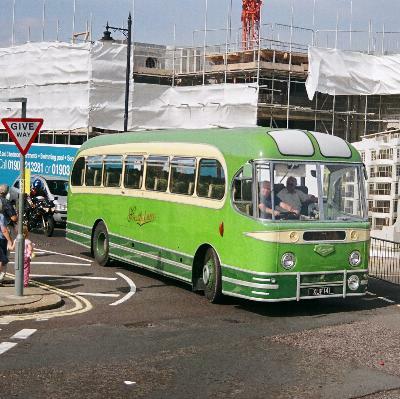 And if ever there was a classic bus company it is Southdown. Combine them both for a celebration of 100 years of transport in the south coast town, and you get a special summer weekend. Fine weather, plenty of visitors and Leo Sayer in concert. What a perfect complement to bus nostalgia. 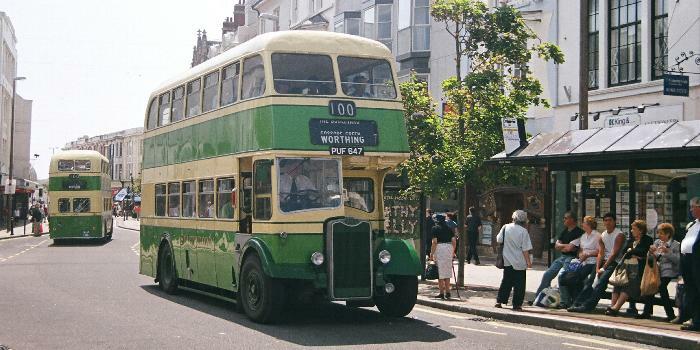 On the Saturday, many vintage vehicles were drafted in to duplicate the section of the 700 coastliner service between Worthing and Brighton. On the Sunday, the usual bus rally took place on the promenade just west of the Beach Hotel. These two views could have been taken 40 years apart. Instead they were only 40 minutes apart. 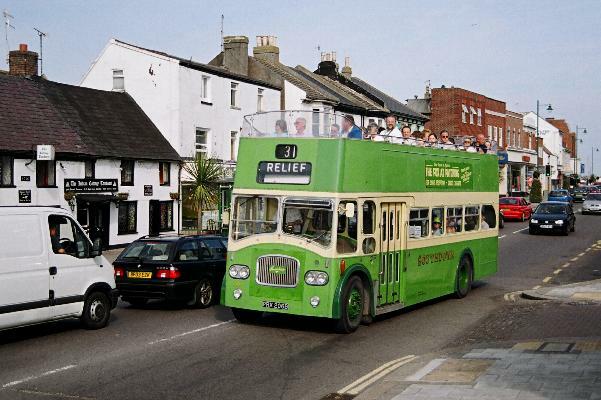 To many enthusiasts, Southdown means Queen Marys (in reality they are Leyland Titan PD3/4s with Northern Counties bodies). Many made an appearance including open top ones and the recently restored panoramic window one. There was a very large turn out of Southdown vehicles in preservation. 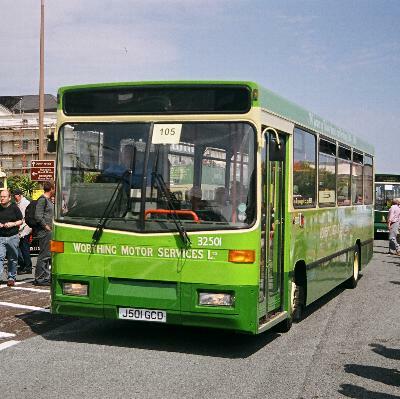 Not only that, but Stagecoach had specially painted a Dart in traditional livery. All photos taken in July 2004. Click to enlarge. 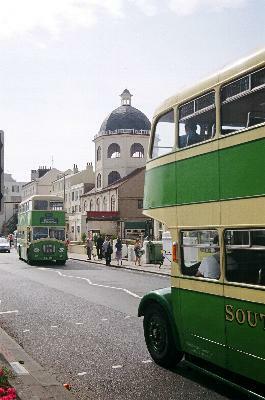 Two vintage Southdown vehicles pass the Dome cinema on Worthing seafront. An open top Queen Mary passes Worthing pier and lido. 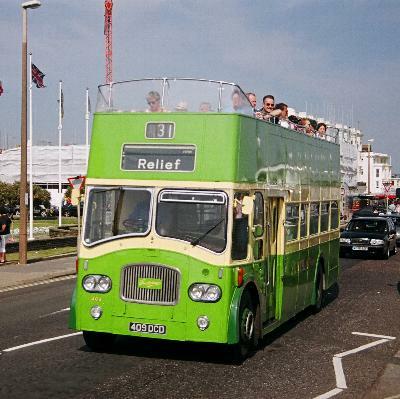 Southdown 409 (409DCD), an open top Queen Mary running as a duplicate on the 31. 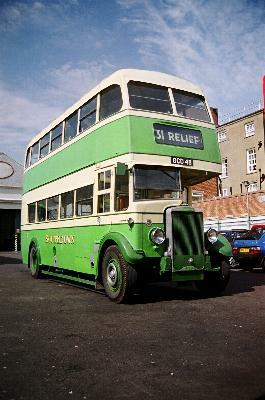 Southdown UF4813, a 1929 Leyland Titan TD1 with a Brush body. 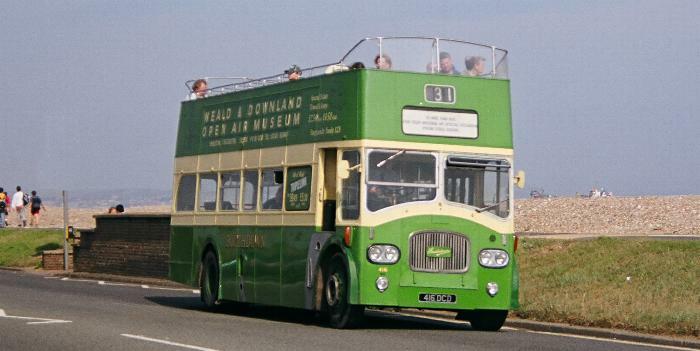 Southdown XUF141, a 1960 Leyland Tiger Cub with a Weymann body. 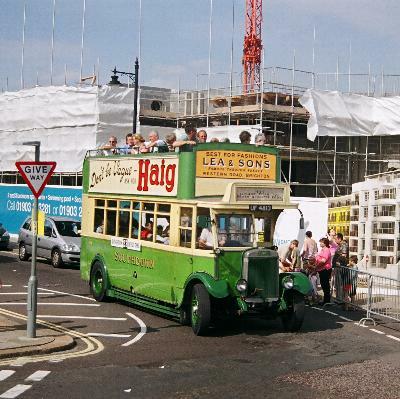 On the prom - Southdown Queen Mary 347 (HCD347E) and Eastbourne 42 (AHC442), an an AEC Regent III with a Bruce body dating from 1951. Southdown 970 (AUF670), a 1934 Leyland TD3 with Short Bros body. 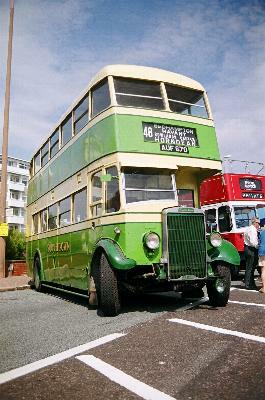 Southdown 547 (PUF647), a 1956 Guy Arab fitted with a Park Royal body. Stagecoach Southdown Transbus-bodied Dart, 34525 (GX04EXV), in the town centre. 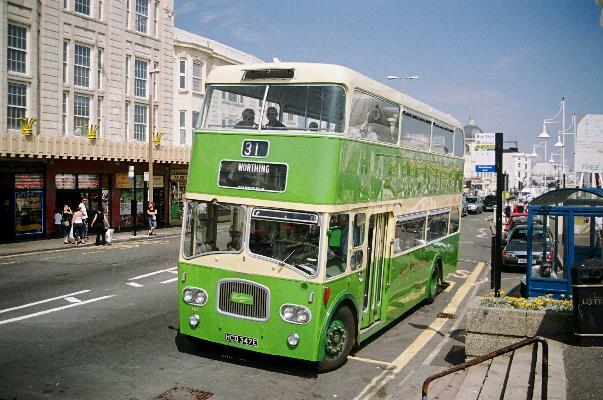 Southdown 401 (PRX206B, originally 401DCD) at Shoreham on its way from Brighton to Worthing. Stagecoach have recently returned several of the cherished xxxDCD marks to Queen Mary owners. 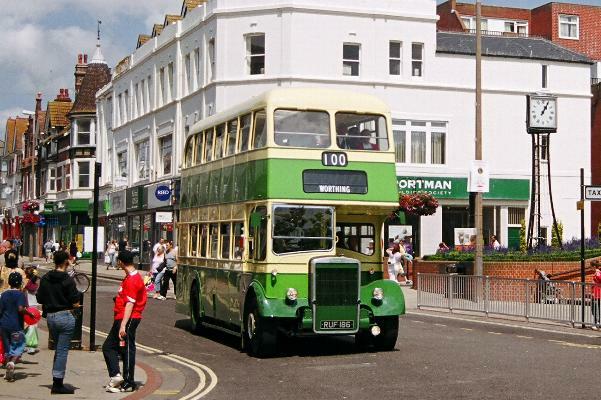 Southdown 416 (416DCD), a 1963 Queen Mary, nearing Worthing. Stephensons 424DCD in Southdown livery at Worthing depot. 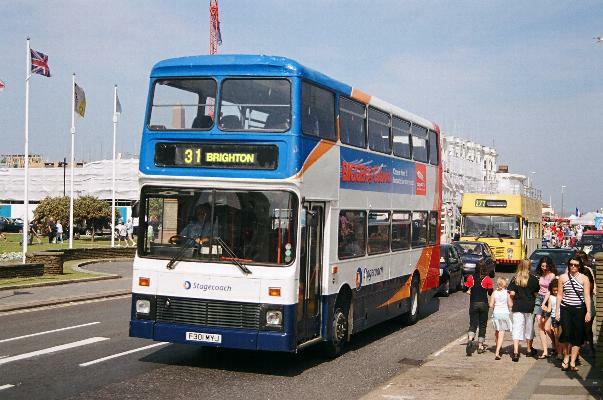 Stagecoach Southdown 7301 (F301MYJ), a Northern Counties bodied Volvo, still in service. 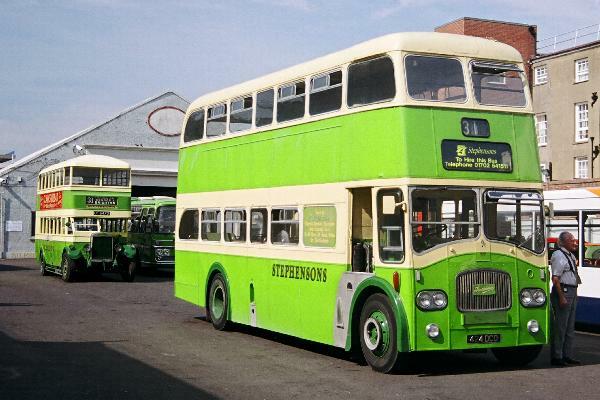 Southdown Leyland Titan PD2 786 (RUF186) with Beadle body from 1957.